The past 12 years saw a check-mark stock market recovery with a down market followed by a big extended up market. You’d think that aggressive TDFs would have been big performance winners, but you'd be surprised. The TDF industry is aggressive at the target date, but there is an index of a conservative approach that has been live for most of the past 12 years. The past 12 years serve as an interesting testing ground for target date funds (TDFs), and represent the entire track record for their use in 401(k) plans. The period begins with a 56% loss in the U.S. stock market from October 2007 to March 2009, followed by an extraordinary 340% gain. Given the disproportionate history of gains over losses you’d expect aggressive TDFs to outperform less aggressive offerings, and this is certainly true for long-dated versus short-dated funds. 2050 funds have outperformed 2010 funds by a lot. But we’d like to examine a more precise question, namely: Have aggressive 2010 funds outperformed conservative 2010 funds? Have aggressive 2050 funds outperformed conservative 2050 funds? You’d think the answer to these questions would be “Yes” but the results might surprise you. As detailed in our benchmark article, the Big 3 TDF providers manage 65% of the industry, so they are in effect the industry. 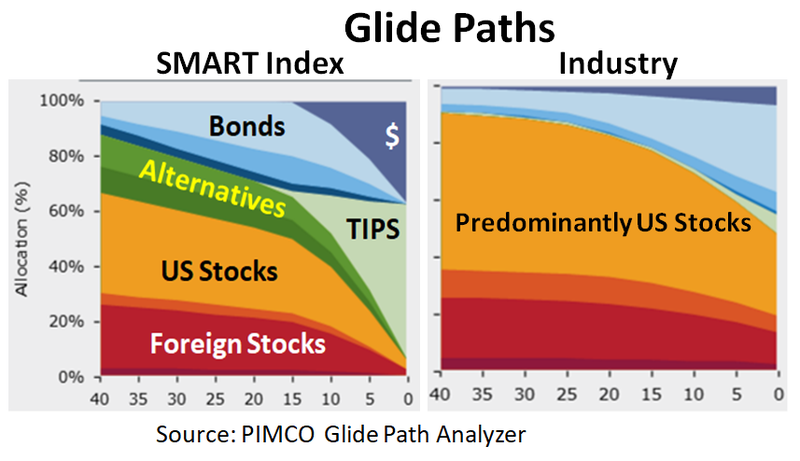 As shown in the following graph, the Big 3 glidepaths are quite similar especially in the Risk Zone that spans the 5 years before and after retirement. The graph also shows the SMART Target Date Fund Index that we use as our measure for a conservative glidepath. As you can see, the Big 3 are all 55% in equities at the target date, whereas the SMART Index is 10%. For simplification in the following, we compare the performance results for the entire TDF industry to those of SMART. The “Industry” is of course predominantly the Big 3. In this analysis the “Industry” represents aggressive allocations and SMART represents defensive. 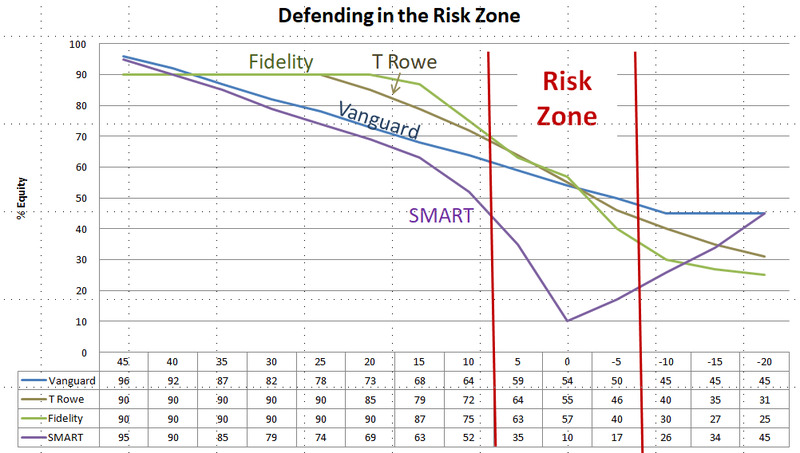 In addition to being more conservative at the target date, SMART is more broadly diversified, which mostly affects the performance of long-dated funds. The following graphs show the growth of $10,000 from September, 2007 to December, 2018. 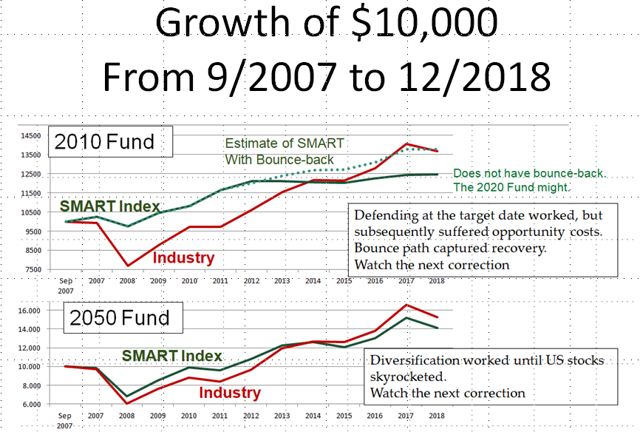 As you can see, the SMART Index outperformed the Industry for the first 7 years 2007-2013 due to defending in the 2008 market loss. This fact went largely unrecognized. Avoiding loss had a large long-lasting benefit. The original design of SMART ended at the target date – it was a “To” fund – but this design has since been changed to re-risk in retirement. According to Jack Towarnacki, Executive Director of the Plan Sponsor Council of America (PSCA), 23% of plan sponsors are now encouraging departed employees to remain in the plan, so we’ve converted SMART into a V-shaped “To-and-Through” fund. This new design will likely be implemented with the current 2020 fund, but the graph shows what would have happened had the SMART 2010 fund re-risked – it would have kept pace with the Industry. Similarly, the broad diversification in the SMART 2050 Fund put it ahead of the Industry for 7 years, but then the Industry concentration in U.S. stocks gave it a modest edge. U.S. stocks have led all asset classes in the past decade, so concentrated, less diversified, funds have led the performance marathon. “It is worth remembering that winning the long-term investment game has more to do with avoidance of losses than the capturing of gains. It is a function of math.” Lance Roberts. Many who suffered the 2008 losses in TDFs did not enjoy the recovery, especially those near retirement. Most retiring people withdraw their accounts. But those who were in defensive funds won by not losing, whether they stayed in the plan or not. The next market correction will bring another test, and who knows how deep the harm will go or how strong the recovery might be. The past 12 years teach us that the opportunity costs of defending can easily be rewarded when corrections occur. History repeats. Age Sage builds better asset allocation models that help Baby Boomers transition through the Risk Zone that spans the 5-10 years before and after retirement. Implementation of these models can be done for less than 6 basis points. Boomers are poised for a sucker punch that they’ll never shake off.